There’s a tangible sense of perspective to the work and life of Elisa Restrepo — raised between Colombia, Costa Rica, and California, perhaps you know Elisa already as one-half of the sophisticated unisex shoe collection Dieppa Restrepo, yet the story of how she got there is equally inspiring. Today, Elisa splits her time between New York City and Montauk, the latter we visited on a rainy day in early fall to discuss how travel, going out on her own, and learning to go with the flow have played parts in who she is and how she structures her life. 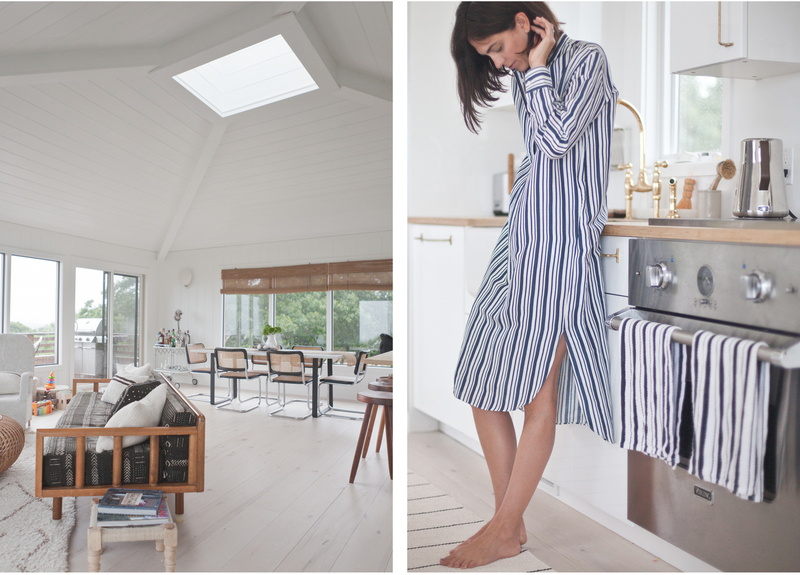 Elisa wears SAMARA SHIRT DRESS in stripe. Can you share a little about your childhood? What was your upbringing like? I grew up between Medellín, Colombia, Mill Valley, CA, and San José, Costa Rica. My early childhood in Medellín was spent surrounded by my extended family. My parents got divorced when I was very young so I spent every weekend either at my grandparents’ farm or my aunt’s cattle ranch. Along with my cousins I milked cows, rode horses, chased chickens, and ate guavas off the trees until my stomach hurt. No matter how busy the adults around me were during the week, they would take these two days to enjoy each other, connect with nature, and shut off the chaos of their day to day. That always stuck with me. My mother was a violinist and left Medellín to play and live in San Francisco. I followed her soon after and lived with her for four years. I returned to my father in Colombia a changed person —I dressed differently, spoke differently, and was much more independent than when I left. At 15 I joined my mother again in Costa Rica. Medellín was going through a very dangerous and violent period and I was happy to get away from that and be able to be carefree and independent once again. All the moving around and being forced to make new friends made me quite adaptable, which is something I have found to be extremely valuable. 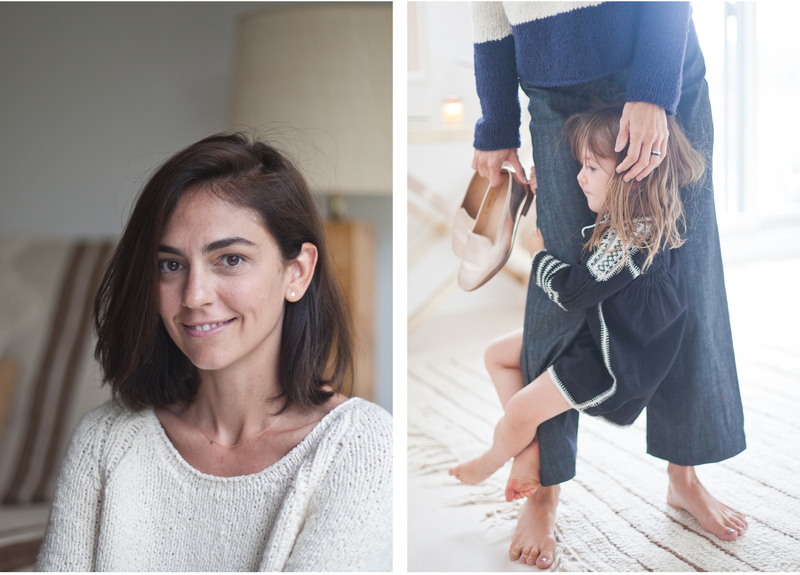 How did Dieppa Restrepo start? My partner Andrea has a knack for finding beautiful things in the most absurd places. She loves the hunt and is a real scavenger in the best sense of the word. When I met her she would always wear a pair of patent leather brogues she found at a tiny men’s store in Mexico City. The shoes weren’t perfect, but the way she would style them always worked. I asked her to buy me a pair and wore them around the city. After receiving countless compliments and hearing questions like “are those Comme des Garcons?,” we decided to go to Mexico and make our own samples. We worked off the initial shoe, completely changing the last, updating the design, and making it better. We developed four other styles and came back home. While Andrea was in LA, wearing our no-name shoe samples, a man came and said “I love your shoes.” That man ended up being Steven Alan. He placed a small order and before we knew it we were back in Mexico working on our first collection. How do you make the long-distance partnership work with Andrea in Mexico? Lots of Skype calls, Wattsapp messages, constant emailing, and trips back and forth. Sometimes the distance is hard, other times it allows you to set your own pace and sort of personally digest what the two of us as a brand collectively conceive. How does a dual perspective in your own life — splitting time between NYC and Montauk — influence your creative process? Though NYC is one of the most unique, innovative, and exciting cities in the world, it’s easy to become engulfed in a somewhat confined aesthetic bubble. Being able to step away, breathe, change your surroundings, and immerse yourself in nature will undoubtedly affect your creative process in a positive and powerful way. When I’m away from New York I’m often reminded of what truly moves me as opposed to what I’m continuously conditioned to be moved by. 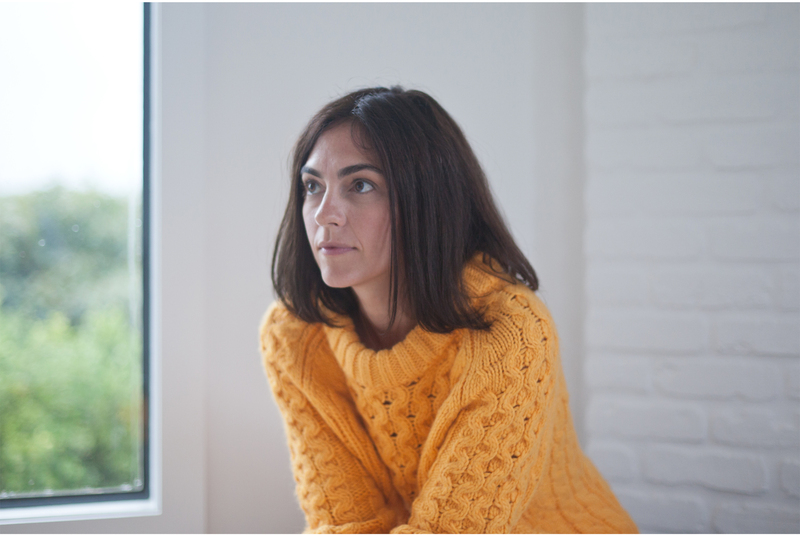 Elisa wears ANALUISA FISHERMAN SWEATER in marigold - email [email protected] to purchase. 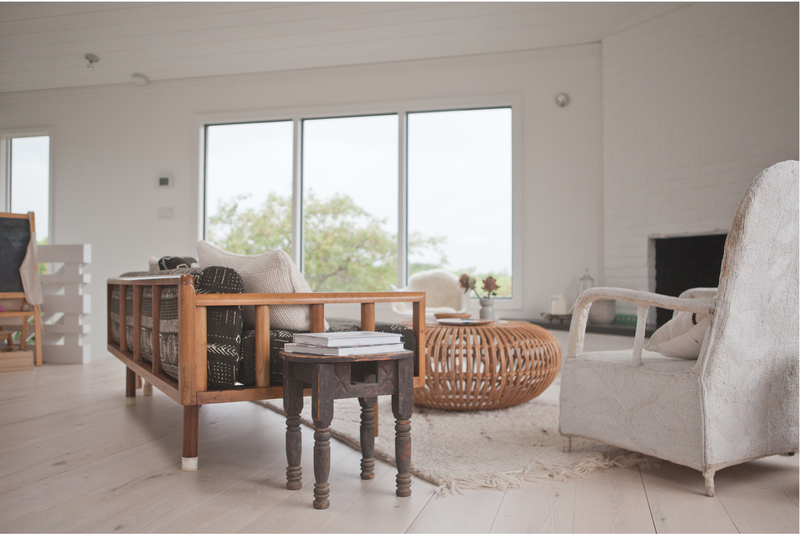 Your Montauk home seems like the perfect place to reset — and it’s obvious that a lot of thought has gone into it. Can you share more about the travel and research that went into finding some of the specific pieces? What are some of your favorite details in the house? We bought the house thinking we would spend a summer living in it before remodeling it. That idea quickly changed when we realized the house was in worse shape than we thought and what started with a few tweaks and updates suddenly became a real renovation. We let the bones of the house guide the interior design and architecture. I wanted to make it as light and airy as possible. We took out walls, put in more windows, changed the floors, and painted all the walls white. I wanted my kids to have a big room since they would share and incorporated an outdoor shed as part of their bedroom. I wanted an office so we could feel like we could spend months at a time there. In terms of interiors the space has evolved organically and in my mind is not yet done! When I was pregnant with my son I went to Morocco with a friend to shop for rugs. I meant business! I bought maybe ten rugs, cushions, textiles, baskets, and outdoor mats in under three days. I kept the colors neutral, focusing mainly on creams, browns, and black. I came back to find that so much of what I purchased worked beautifully and added warmth to the otherwise clean white space. Many of the pieces were purchased from friends or brought over from Brooklyn. The marble dining table was originally a failed attempt at a kitchen island, the stools belonged to my good friend Dina. I love a corner in the entry level that has a tall wooden chair built by the previous owner and two photographs taken by my grandfather when he was in his twenties. I grew up seeing them on the wall in his farm and asked my uncle if I could take them a few years ago. They are a constant reminder of my country and my childhood. I love the hidden bookshelves behind the door to my kids' room, the Mexican tile in the guest bathroom, the Japanese brass handles in the kitchen, the light that comes through the skylight upstairs. But more than anything I love seeing the bay and the trees of the nature preserve as I walk up the stairs every morning. What are some of the challenges of living in two places? Can you offer any advice or tips on making it work? I still feel like a rookie and am always asking for advice. I overpack and although conceptually I understand that less is actually more, I still can’t seem to learn. I look to friends like Jesse Kamm and want nothing more than to edit, simplify, and learn to travel light! Tips: Have a duplicate set of essentials, like reading glasses, vitamins, your kids’ favorite books. Leave a key with someone you trust. This may be more specific to me, but I can get very caught up in constantly organizing. It’s a way for me to mentally control my surroundings and impede myself from feeling too overwhelmed. I end up missing out on much needed hours of fun or relaxation. I’m trying to learn to lighten up and at least attempt to enjoy a little mess once in a while. But really all that brings me back to the original challenge: Decluttering. The less stuff you have, the less stuff you have to deal with. You mentioned both the challenges and the independence that comes from being far away from family in Colombia — can you share more about how going out on your own has allowed you to define your own way of parenting? When you are from a small, homogeneous community, it is not uncommon for your family to play a major role in the type of parent you will become. When you are out on your own, your natural instincts are what steer you into in the direction that works for you. I pull from my childhood, of course, and hope to pass on the values I was brought up with. However, I also get to draw inspiration from a wonderfully diverse community of mothers that are so generous with their knowledge and experiences. "I’m trying to learn to lighten up and at least attempt to enjoy a little mess once in a while. But really all that brings me back to the original challenge: Decluttering. The less stuff you have, the less stuff you have to deal with." Drinking my coffee in bed with my two kids and sleepy husband. That time when the four of us are together might last five minutes or fifteen, but it is a cherished moment before everyone is up and off. Can you share the schedule of a typical day in the life? If there is no “typical” day for you, what constants remain? There really is no typical day which, I’ll admit, is a tremendous luxury. However my day always starts with me drinking coffee (I am not human until that first sip) in bed with my two kids and my husband. We lounge and cuddle until it’s time to get my daughter ready and off to school. The rest of the day varies. I may work from home or go into the office. No matter what, I’m regularly emailing and messaging my partner and our team. I will most likely do some exercise or meet a friend for lunch. Evenings at home usually involve family dance parties, dinner, story time, and a show or movie in bed with my husband. What do you make for dinner alone? I get a bit lazy when cooking for myself. If I don’t end up eating my daughter’s leftovers, I’ll make myself a salad with a simple olive oil/lemon dressing, or a piece of avocado toast (toasted whole grain bread, Vegenaise, avocado, olive oil, lemon, salt, and crushed red pepper). I’m so much more inspired to cook in Montauk. I’ll stock my fridge with fresh ingredients from the farmer’s market and make easy dishes, like a chicken paillard with arugula, sungold tomatoes, thinly sliced jalapeños, and a mustard/lemon dressing. What do you make for a dinner with friends? Can you share a recipe? Directions: Pour half the marinade over your fish (I have tried salmon, halibut, and swordfish), and allow it to sit at room temperature for as long as you can (10-45 mins). Preheat the grill or broiler until hot and cook the fish for about 5 minutes on each side (or until flaky). Transfer to a platter, pour the reserved marinade on top, and voilá! Serve with cous-cous, grilled veggies like zucchini and asparagus, and a delicious bottle of wine. When I’m stressed or frustrated with a situation that I cannot change, I always tell myself, “You cannot fight against reality, you can only change the way you perceive it and learn from it.” I also had a dream once where I was giving a toast at my husband’s birthday and said, “Thank you for teaching me that life doesn’t have to be perfect to be wonderful.” As a perfectionist and control freak, it’s a nice thing to remember. What’s the last thing that — truly — inspired you? Surfing in Montauk recently on a weekday morning. It was 8am and foggy and everything had this sort of golden grey filter to it, if that makes any sense. The waves were small and far between so we were all just sitting in the water waiting. I was completely overcome with this beautiful sense of community. The idea that we were all there—a group of strangers connected by the water and the desire to experience this one thing. I’ve had this feeling before, watching someone perform or even dancing in a crowded room. It’s not so much what you are doing or watching or hearing…but the interconnectedness you feel with the other people around you. I’d probably cry if I saw one of those flashmob dances! Elisa wears COLORBLOCK SWEATER - email [email protected] to purchase and HIGH-WAIST CROP in japanese raw.